Why does my policy look different when I'm editing it than when I save or publish it? If your policy / document uses an outline, you may notice that there are differences between what you see when you are creating/editing it and what you see once you save the draft or publish the policy. In the above example, the numbering on the outline in Edit Draft uses only a basic numbered list indented to different levels. But View Draft and View Published have the full outline structure with correct lettering/ numbering for each level. Unfortunately, there is not a way to fix the discrepancy between the appearance of Edit Draft and View Draft or View Published. As you are working on your policy, please note that how the policy appears in View Draft is how it will appear on the site once it is published. So don’t be concerned if the policy formatting doesn’t look right while you are editing it. But once you have saved the draft, please review the saved version to ensure that the formatting is correct there. If the formatting still appears incorrect in View Draft or Published, please e-mail policy@ku.edu or call (785) 864-9600 for assistance. What if I need a different outline format than the Policy Library's standard one? Can I print a copy of my policy from the Policy Library? Yes, you can print any policy page using the ‘Print’ function of your browser (we recommend Chrome for best appearance/results). In Chrome, click on the menu button, in the top-right corner: and then choose ‘Print’. Choose the settings you would like the printout to have, and click ‘Print’ (in Chrome, this will be at the top of the ‘Print’ dialog box). In Firefox, click the ‘Firefox’ drop-down menu in the top-left corner and select ‘Print’. Choose the settings you would like the printout to have, and click ‘OK’. In Internet Explorer, on the Menu bar across the top, click on ‘File’, and select ‘Print’. Choose the desired settings for the printout, and click ‘Print’. You can also bring up the Print dialog box in any browser by pressing the Ctrl and P keys on your keyboard simultaneously. To print just a specific part of a policy, rather than the full document or specified page ranges, highlight the text to be printed, and then follow the process described above for the browser you are using, being sure to select the option for 'Selection'. That option will only be available to choose if you have already highlighted the portion of the text that you want to print. Why does my policy's formatting look wrong when pasted into the text boxes? If your policy is originally in a Microsoft Word document, when you paste normally (by right-clicking and selecting Paste, or by using the Ctrl + v key combination), it may not be formatted correctly. This is because Word transfers extra formatting information into Drupal’s HTML code when pasted normally. That extra information can disrupt the policy’s format by adding extra spacing, creating line breaks mid-sentence, changing font size/styling, etc. To avoid those and other formatting issues, use Drupal’s Paste from Word button (the clipboard with the W at the bottom). Paste from Word keeps the visible formatting from your policy’s Word version and removes unnecessary HTML information that disrupts the display in Drupal. 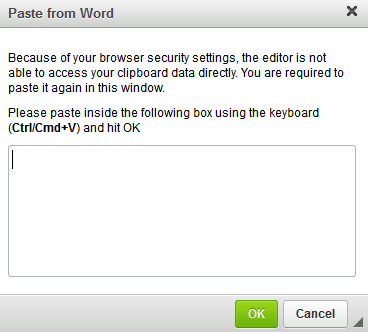 Once you click Paste from Word, depending on what browser you are using, it will either bring up a box for you to paste the text into (Chrome and Firefox), or a dialog box asking you if want to allow the webpage access to your clipboard (Internet Explorer). If you are in Firefox or Chrome, when you paste it into the pop-up box, it may look like it does not have any formatting applied, but once you click OK, it will show in the main text box with the correct formatting applied. If you are using IE and choose Allow access, it will paste the text directly into the main text box, with the correct formatting that the policy had in the Word version. This will remove all formatting from the text, and you will have to go back through to re-apply any desired formatting using the options available in the content editor’s two rows of buttons. However, this is typically quicker than trying to fix incorrect formatting caused by pasting directly from PDFs or other document types. If you are using Paste from Word and/or Paste as plain text, and your policy’s formatting is still not correct, please contact us at policy@ku.edu or 785-864-9600 for assistance. How do I set a customized URL for my policy? When you are creating or editing your policy page or PDF page, when you scroll down to the bottom of the page to save it, you will notice two tabs along the left column, with URL path settings showing by default. It will initially be set to Generate automatic URL alias, but we recommend creating a custom alias to ensure that all policy URLs are consistent and standardized. To create a custom alias, uncheck the box next to Generate automatic URL alias. Once you have unchecked the box, you will be able to click the text entry line below URL alias, and enter your own URL settings for the policy. The policy.ku.edu/ will already be automatically included, so the URL you enter for each page just needs to begin with the Policy Owner name established for your office (review the list below if you are uncertain). Then you will add a / (forward-slash), and a concise version of the name of your policy (preferably excluding words such as ‘of, ’ ‘the,’ ‘a,’ etc. and separating words with dashes - ). So it will look like this: office-name/policy-name. What is the prefix for my unit for creating URLs for my policy? How can I review all updates to my policy since it was added to the Policy Library? In addition to the publicly visible Change History box (which is used to note primarily content-based updates, such as changes made as a result of review and approval by a governing board), there is a tab for Revision Information on the left column at the bottom of the policy page. If you click on this tab, you will notice the box for Revision log message. The information added to this box will only be visible to users who have access to edit/administer policies, via the Moderate tab at the top of each policy’s page. We recommend providing as much detail as possible in this space, so that if you need to track when a specific change was made on a policy, you know that it will have been recorded in the Revision log message, and you can just review all of those on the Moderate tab. Or if you have more than one policy contributor from your office, it can help ensure that you’re not making an update that will undo a change another contributor just made. Generally, it just provides a helpful method for keeping a detailed record of updates/changes made to the policy. The box will automatically show your username, and when you save the page, it will add a date and time that the update was made, so that along with your notes, it will provide a detailed record of who made the update, when, and what was updated. This tab is also where you can set the Moderation state, or whether the policy is still a Draft (which means that you have further work to do before it is ready for review and publishing), or Needs Review, so that it can be reviewed for completeness and published. As long as a policy is saved in Draft form, it will not be available for editing or publishing by Policy Library moderators; once you save your policy as Needs Review, it shows up for Policy Library moderators to review and publish. Why hasn't my new or updated policy been published yet? If you saved a new or updated policy that was ready to publish several days ago (or longer), and it has not yet been published, check the Revision information tab at the bottom-left of the page to ensure that the Moderation State is Needs Review. A policy has to be saved as Needs Review before it will be visible to Policy Library moderators as ready to be published; if it is still saved as Draft, it is only visible to the creator/editor of the draft. However, if you have verified that you did save it as Needs Review and it has not been published yet, please e-mail us at policy@ku.edu or call us at 785-864-9600 so that we can make sure everything is working correctly and we are able to access it, and then we can review and publish it as soon as possible. I added anchors in Policy Statement; why can’t I link to them from List of Sections? To include a list of sections within your policy document, simply list the relevant policy sections you would like to highlight. Policy Office staff will provide assistance with adding anchors to the corresponding Policy Statement text, or if the anchors have already been created, with adding them as "jump down" links in the List of Sections text.